Hi everyone! My name is Pedro Santos, and I’m participating in the PRACE Summer of HPC 2018 programme. I’m from Coimbra, Portugal, home to one of the oldest universities in Europe (dating back to 1290), which has very rich and unique academic traditions, which I carry in my heart. I have obtained a degree in Chemical Engineering at the University of Coimbra, after finishing my MSc thesis in September 2015 in the area of polymer science. Afterwards, I worked for a year in that field, but I grew dissatisfied with the routines of a chemistry laboratory. I wanted something more challenging. That’s when I was introduced to the exciting world of molecular modelling. It became a way to express my love for chemistry and computer science at the same time. This is a rapidly growing field with immense opportunities for research. Since March 2017 I’ve been working on molecular simulation for materials design, as part of a research project, and I’m starting my PhD in this area next year, at the University of Coimbra. It was in this period that my supervisor first told me about PRACE Summer of HPC. As I was still taking my baby steps into molecular simulation techniques, I immediately thought this was the perfect opportunity to take a big step forwards in my learning curve. On one hand, I get to learn about High Performance Computing (HPC), the “beating heart” that drives all chemical simulations today (and without it the exponential growth in that field would have been impossible) and also, as a bonus, brush up my programming skills. On the other hand, being accepted in a project that involves the use of molecular dynamics and metadynamics, two techniques I will extensively use in my PhD, is an amazing opportunity to get expertise from people with much more experience in those particular areas. PRACE Summer of HPC also presented somewhat of a personal challenge to me. This was the first time I traveled abroad and by airplane. At first I was afraid, but I took on the spirit of the Portuguese discoverers of 500 years ago and surged on into the unknown. I actually had a lot of fun in all my travels, and even got a sneaky peek into Paris in my first connection. Still, I would say I prefer the quiet and cosy setting of Edinburgh, which I had the pleasure to explore in great company during the training week. It was an intense but rewarding week, as I flexed my programming muscles with MPI, and shared stories with wonderful people from around the world. 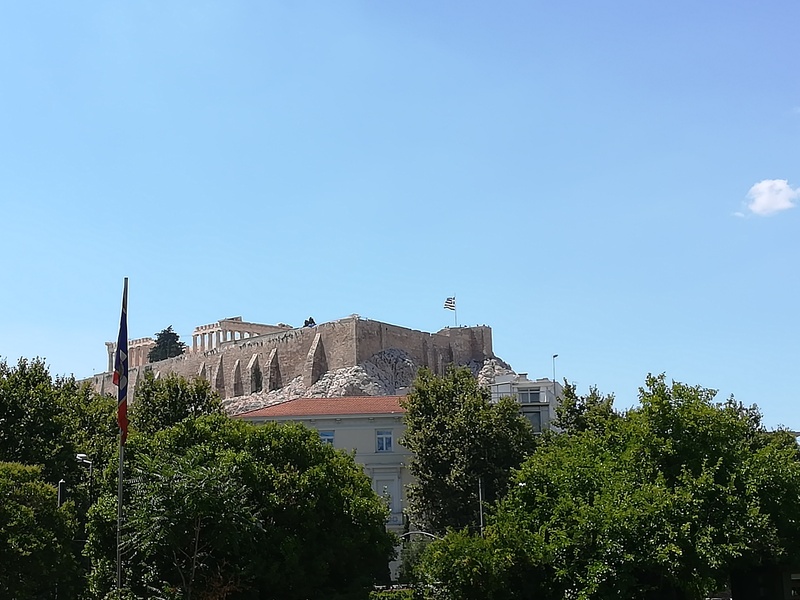 And now, as I settle in Athens and in the lab supervised by Dr. Zoe Cournia at BRFAA (to whose members I thank for the warm welcome), a new adventure is beginning. I will be working on an exciting and extremely relevant project, regarding the simulation of a mutation in the PI3Ka protein, which is known to be related to carcinogenesis. I’m sure I will learn many concepts and expertise that will be useful for me in the future. I will also have to face the daily challenges of living in a foreign country, with a language unknown to me (even a completely different keyboard layout! o.O) – but that will only make me a better man in the end. And, most of all, I will explore the best this city has to offer and have some fun! A photo I took of the most iconic landmark of Athens: the Acropolis!